The Alt-Azimuth mounting is a simple design usually with a means of elevating and rotating the telescope. 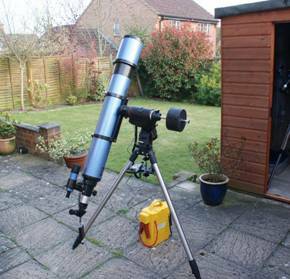 In this article we will be moving on to consider how to use an ‘EQUATORIAL’ mounted telescope to observe or take images using an attached camera. The Dobsonian mount is a very simple version of the wider range of telescope mounts known as the Alt-Azimuth. This simply means the mount has one vertical axis that allows rotation around the horizon known as the ‘AZIMUTH’. It also has a horizontal axis that provides ‘ALTITUDE’ of the tube assembly from the horizontal position to vertical. 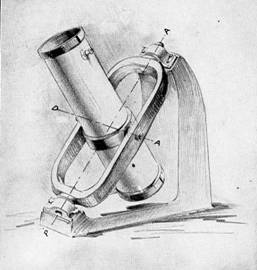 The typical example of this type of mount is the seaside telescope. 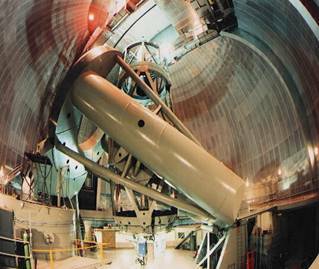 An Alt-Azimuth Telescope can have a telescope tube assembly very similar to the Newtonian usually used with a Dobsonian mount. There is however no reason why any one of the many telescope tube assembly designs can’t be used with any of the Alt-Azimuth or Equatorial Mount designs. The Alt-Azimuth Mount is a simple design with its most simplified version in the form of the Dobsonian. It does however have one major drawback in that it is quite difficult to use with a powered drive. Astronomical targets such as stars, planets and deep sky objects appear to move across the sky in an arc from east to west. This arced track is caused by the rotation of Earth on its 23.4 degree tilted axis. As Earth rotates, the tilt causes the stars to rise in an arc from the east. The highest point is reached as the stars are in the south. They then follow the arc down into the west. 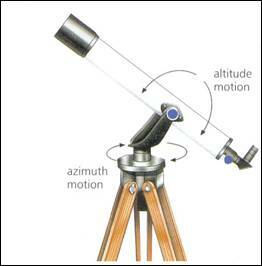 By setting the ‘Azimuth’ axis of the telescope mounting at an angle equal to the tilt of the Earth, the telescope can be made to trace the same arc across the sky as the stars follow. This tilted ‘Azimuth’ axis, which is known as the Right Ascension (RA) axis, will now be pointed towards the same point in the sky as does the north axis of Earth; this point is known as the Celestial Pole. We in the northern hemisphere are very lucky to have a fairly bright star close to the north celestial pole. This is the star Polaris (The North Star or Pole Star) in the constellation of Ursa Minor (The Little Bear). The major advantage of the Equatorial mounting is in its ability to be driven on just one axis to track objects across the sky. By driving the axis with a motor that will give one rotation every 24 hours the telescope will rotate at the same speed as Earth. This type of drive is essential if the telescope is going to be used for photographs or digital imaging with exposure times exceeding 30 seconds. There are a number of different designs of equatorial type mountings. The beautiful hand drawn pictures below are taken from a very famous book written in 1937 by Rev. 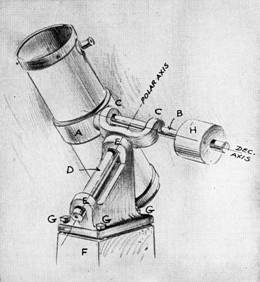 Albert G. Ingalls called Amateur Telescope Making. 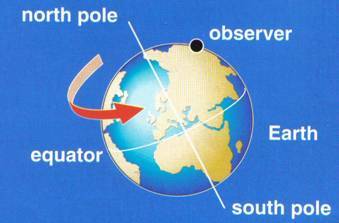 The German Equatorial Mounting design is the most common equatorial mounting used by modern amateur astronomers. The 120mm Skywatcher refractor is mounted on a typical mounting of this type. This design is often used to mount large professional telescopes. A similar set-up is achieved by fitting a Schmidt Cassegrain Telescope (SCT) such as a Meade on an Equatorial Wedge. 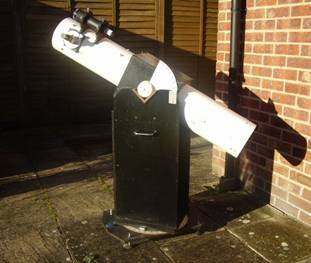 The Newbury Astronomical Society’s SCT (Daren’s telescope) is shown mounted on an equatorial wedge. This design is also used to mount many large professional telescopes. There are a number of variations on this theme that will allow access to the area of sky around the poles. 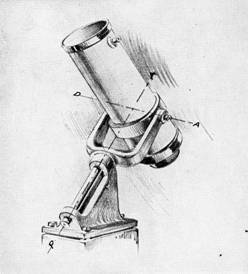 The upper yoke is often greatly enlarged into a ‘horse shoe’ shape so that the telescope tube can be pointed through the upper bearing to gain access to the sky close to the pole. The picture of the 200inch Hale Telescope shown in the next column shows the upper yoke bearing enlarged and cut away as described above. The Hale was for many years the largest telescope in the world. Setting up an equatorial mounted telescope is more difficult than an Alt-Azimuth but it is not too difficult. In both types of mounting it is necessary to ensure that the mounting feet are stable and level. The levelling becomes more important with the degree of accuracy that is required for the observing task to be undertaken. If just visual observing is planned then an Alt-Azimuth may not need to be levelled at all. However the equatorial really needs to be levelled for every session to enable it to track objects. Some Alt-Azimuth mounts have setting circles to enable objects to be found using the positions given by charts or computer programmes. To do this the mount needs to be levelled and aligned with a set position, normally north. 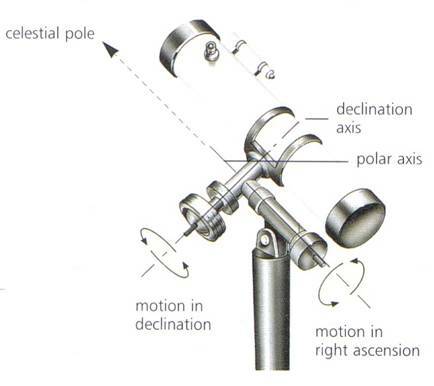 The equatorial mount requires the same alignment but needs the additional alignment of the Right Ascension (RA) axis to the Celestial Pole. We are fortunate to have a star very close to the North Celestial Pole. This star is Polaris (The North Star also called The Pole Star) located in the constellation of Ursa Minor (The Little Bear). 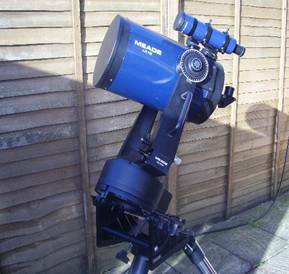 Some equatorial mounts have a small telescope fitted into the RA bearing that can used to align the axis to the pole star. If not the telescope needs to be positioned to zero ‘0’ on the RA setting circle and locked. The Declination setting circle needs to be set to 90° and locked. The mounting then has to be adjusted so that the RA axis is aligned to the north and is elevated so that the telescope points towards Polaris. The accuracy of the alignment can be checked by rotating the telescope around on the RA axis. Looking through the finder it should describe a small circle around Polaris. To accurately align the RA for imaging work requires further alignment beyond the scope of this article.